I started thinking about HOW we could do this and make a meaningful learning experience for students. I came up with the idea of linking to a map in each unit that students could interact with in order to visualize where the civilizations were and to learn more about each of them. I proposed the idea to Andrew and he mocked up a sample that we both presented to the SME and AAPM. With some minor tweaking based on a collaborative effort we came up with this interactive map. As part of the design of the courses at Post University, we incorporate brief videos that enable students to get an overview or introduction to what they will be learning in the course. The video, included on the right, is an example of a special introductory video that was created for College Writing, one of the first five courses students take when starting an academic degree program at Post University. We began by collaborating with Kristin Santa Maria, our Subject Matter Expert, to create, edit, and revise a script. Then, sent the script off to the multimedia team The animation of the tree at the beginning of the video was created and produced by Geoff Smith (Multimedia Developer) using feedback provided by instructional design team members and administration at Post University. The specific course information section of the video was produced by Jessy Miele (Multimedia Developer) and the voice-over was recorded by Madelaine Smith (Instructional Design Assistant). Click on the image to view this assessment example. By presenting a situation that learners may have experienced, they were able to make a personal connection to the learning and application of concepts covered in the course. formulate their own arguments based on learned theories during the term. ​Students completed this assessment in a way that was meaningful and engaging and allowed them to create a professional portfolio item. As part of the assessment segment of course development, I guide SMEs through sculpting questions for discussion among students. These questions are thought provoking and engage learners to use critical thinking skills by applying what they have learned, and incorporating personal experience that is relevant to the conversation. Below are examples of discussion questions created for undergraduate and graduate courses. Equine Care and Management- Discuss from your own experience, how horses and other equines interact differently with humans than they do with others of their own species. Then, explain the way the equine’s natural instincts have evolved to make them work so well with humans. Compensation and Benefits- Compensation refers to all forms of financial returns and tangible services and benefits employees receive as part of an employment relationship. Employees often perceive their compensation in different ways - as a return in exchange for their labors, as an entitlement, or as a reward. In what way do you perceive compensation and how did your perspective on compensation develop? Effective Communication for Criminal Justice Professionals- Scenario: You have just finished your police report, handed the case to the District Attorney for prosecution. After reviewing your files, you see that you omitted something that is not crucial to the case. You have done this before and although not happy, the DA was not concerned, but did mention this to your supervisor. Discuss what you would do in this situation and explain your decision to share or not share the omitted information with the District Attorney. ​Innovative Leadership & Management- Think about a time that you had a good idea but did not share it with others. Explain your reasoning for not sharing your good ideas with others. Then, describe under what circumstances you would have been willing to share your good idea with others and what you did or could have done to set the stage to share your good idea. Part of my job as an instructional designer is testing the conditions and environments under which students might access their learning materials. 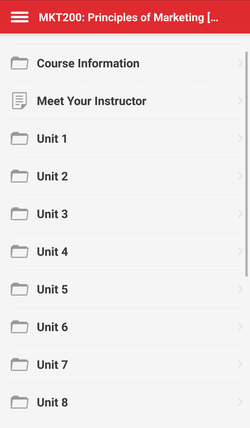 Recently, we implemented a new course design template for our onboarding courses, the first courses that students take when they begin their academic degree program at Post University, to provide an engaging look and feel for the learners. This new look is featured in fig. 1 below. When creating each content item for this design, the title color was changed to white so it would not display since a color banner title was created using html code; however, screen readers still "see" this text. 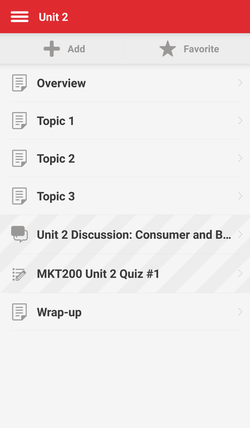 When checking this course through the Blackboard mobile application, I noticed that the white content titles were also visible in the display (see fig. 3), unlike in the web version of the Blackboard course seen in fig. 1 above. Therefore, I went into the content items and changed the titles to match the sections. This is reflected in fig. 4, on the far right below. 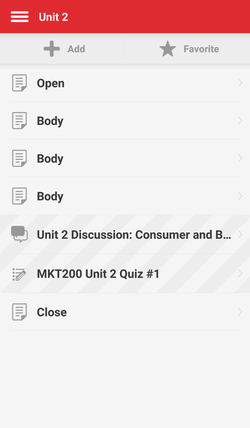 Now, the titles make sense in the mobile application as well as when they are read by a screen reader in the web version of the Blackboard course.